The AG-MSU10 is a lightweight mobile storage unit that simplifies backing-up P2 content in the field. The MSU10 offers one P2 card slot and a slot for the removable AG-MBX10 tray, which houses a 2.5" drive (not included). The compact P2 Media Storage Unit removes the need for computers or larger, more expensive appliances in the field and can quickly free up P2 cards for additional shooting. The AG-MSU10 offers the flexibility of AC or battery operation and includes USB 2.0 and eSATA interfaces for easy connection to NLEs. The AG-MBX10 removable drive tray also includes USB 2.0 and eSATA interfaces. This bus-powered unit can be easily transported from the field and connected to NLEs, including PCs and Macs, to expedite the editing process. Content is transferred from a P2 card to the drive at four times real-time. The MSU10 is perfect for the field and supports multiple workflows. In addition to back-up from the P2 card to removable MBX10 tray drive, the MSU10 also allows offers Host and Device functions. 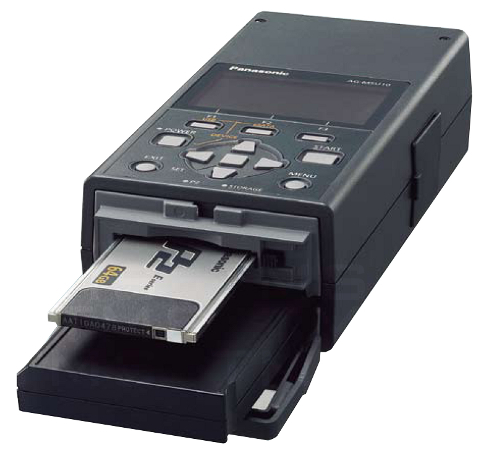 This allows the unit to be a P2 card reader (when connected to a computer), or to host an external drive for copying to that drive. Standard accessories include one AG-MBX10G removable tray, one battery, one battery charge, one AC adapter, one AC power supply cable (for the battery charger), one AC power supply cable (for the AC adapter), two USB cables. Drive and eSATA cable not included. A list of approved drives is available.